The Ocotillo Performing Arts Center is continuing to make spirits merry and bright in Artesia this month with their full slate of holiday entertainment offerings. Midwinter Holiday at 7 p.m. Tuesday, Dec. 19, is an evening of medieval and traditional Christmas ballads. Tickets are $20 for adults, $10 for children. At 7 p.m. Thursday, Dec. 21, the ghosts of Christmas Past, Present and Future – one of whom will be in enormous puppet form – will arrive at the OPAC to remind everyone of the true meaning of the holidays in Charles Dickens’ classic “A Christmas Carol.” Tickets for that performance are $35 for adults, $15 for children. 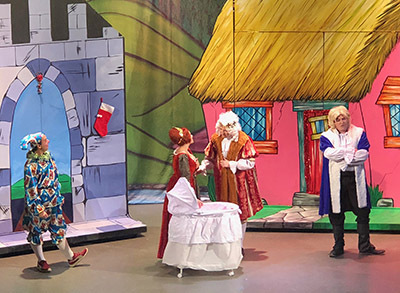 “This is a play from a national touring company, and it’s a big show for us, so hopefully people will come out to see that holiday favorite,” Schotz says. In addition to the three major Christmas shows, the Artesia Arts Council will also be hosting several events this month, including its ever-popular 13th Annual Gingerbread House Workshop. This year’s workshop will be held from 9 a.m. – noon Saturday, Dec. 9, at First Christian Church. “Last year, we almost got to the point where we needed more room, so we’re going over to First Christian Church this year,” says Schotz. “We encourage people to come out and enjoy this workshop. At 6:30 p.m. Friday, Dec. 8, the OPAC will host its monthly “Canvas and…” paint-along series with instructor Kelly Speckhart, this month featuring an image of a “Clever Frog.” Cost is $35 for singles, $60 for duos. At 1 p.m. Sunday, Dec. 10, Seanna Nix of Z-Bar-X Two Sisters Gallery will conduct a workshop on essential oils. Attendees will learn about oil application and aromatherapy, as well as have the opportunity to mix their own oils to take home. Cost is $30, all supplies included. And as the new year begins, so will the next portion of the OPAC’s lineup of shows. “We come right back at ya in January starting Jan. 14 with “An Evening with Groucho Marx,” Schotz says. “The impersonator performs three different eras in Groucho Marx’s life in three different sets, so that will be exciting and something completely different. Tickets for all of the above shows and workshops may be purchased online at www.artesiaartscouncil.com or at the OPAC box office, 746-4212.